The global market for textile coating is forecasted to grow steadily over the forthcoming years, as reported by a Transparency Market Research (TMR) study. 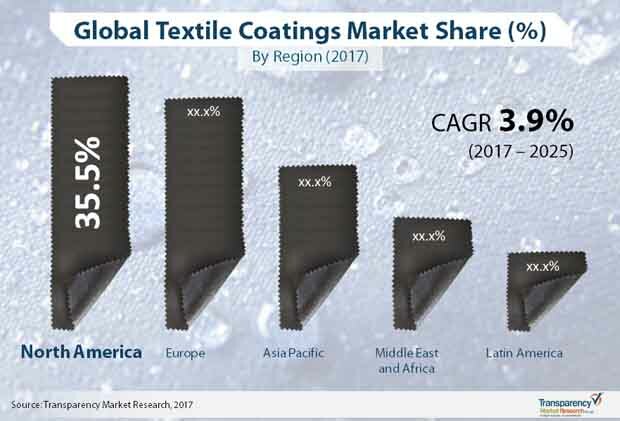 The competitive ecosystem of the textile coatings market is anticipate do remain fragmented amongst the regional vendors over the duration of forecast, 2017 to 2015, according to the report. The competition is said to be fairly even among the market players; yet, a few vendors currently hold a dominant market position, in terms of market share. Established players in the market are at the top on account of holding a largely global presence. These companies are expected to focus on enhancing their product portfolio in order to remain at the top, and to offer a sundry product portfolio across different verticals. Other market vendors are anticipated to focus on improving product quality and expanding their production capacities in order to leave their footprint in the global competitive landscape. Key vendors in the global textile coating market are The Dow Chemical Company, Huntsman International LLC, Omnova Solutions Inc., Sumitomo Chemical Company, and Clariant AG, among several others. Over the forecast period of 2017 to 2025, TMR analysts predict that the global textile coatings market is likely to expand at a 3.9% CAGR. Evaluated to be worth US$3406.0 mn in 2016, the global market is predicted to reach US$4918.5 mn by the end of the forecast period. The global textile covering market is being driven by the expanding quality and execution guidelines in end utilize enterprises, for example, expanding execution prerequisites, expanding fire security controls, and expanding quality benchmarks in clothes industry. Also, presentation of new creative advancements or products is expected to open new markets for textile coatings. Fast urbanization, expanding populace, and rising demand for home style things in creating countries are different factors that could drive the market growth. Better opposition to oil, heat, soil and water, are the key properties upgrading the product request. Expanding speculation on innovative work to improve fiber advances, improve moisture content, and repulse water and heat to give comfort will drive the demand. Different components in charge of the market growth incorporate expanding execution principles at end-utility enterprises, quality gauges and fire security controls are impelling the market growth. Presentation of creative technologies and product is expected to fuel the market. Nonetheless, expanding concerns towards PVC textile coatings and rising dangers from bio-based options may hinder the global market growth. Discussing restrictions, the global textile coatings market maybe be hampered because of a few expanding ecological concerns due to bio-based choices. A few governments from various nations have given endorsement for these bio-based products, which has made them catch a lot of the global textile coatings share of the overall industry. Notwithstanding, a great deal of accentuation is being put on diminishing the ecological impacts that may be caused because of assembling of textile coatings, in this manner hoping to decrease the force of restrictions following up on the global textile coatings market.